LGEF funds essential teachers and staff at ​Blossom Hill, Daves Avenue, Lexington, Louise Van Meter, and RJ Fisher. Your donation to LGEF has one purpose: fund additional teachers and staff at Los Gatos schools to ensure our children get the education they deserve. These teachers and staff are essential to "educating the whole child" and are positions that the state will not fund. LGEF grants for 2018-19 total $850,000, a 54% increase from 2017-18. Starting with the 2018-19 school year LGEF assumes responsibility for funding all supplemental staff at all schools. LGEF Spotlight is a series of articles that highlight some of the incredible teachers and staff who receive LGEF funding. How does LGEF work together with your Home & School Club? Literacy support for those students with need is an essential part of a well-rounded education. LGEF contributes towards Literacy Specialists at all four elementary schools. ​Read more about what our Literacy Specialists do including photos and quotes. Math support for those students with need is an essential part of a well-rounded education. LGEF contributes towards Math Specialists at all four elementary schools. LGEF funds exceptional elementary music education. In Kindergarten, students concentrate on music and movement. The first and second grades focus on sounds, counting and singing. By third grade, students have the opportunity to learn the recorder. Fourth graders become familiar with the violin. Fifth graders are offered a choice of flute, clarinet, trumpet, trombone, violin, cello, voice or percussion and can prepare for the many Middle School music options. LGEF funds elementary art education at all four schools. Here are a few examples: In Kindergarten, students read The Leaf Man by Lois Ehlert and create their own collage of a creature from collected leaves. In third grade, students paint a watercolor of birch trees during their favorite season, and select the colors for their landscapes according to the season they choose. In fifth grade students use Georgia O’Keefe’s technique of zooming in on object to create a detailed section of that object. To learn more about K-5 art lessons and see samples of students’ artwork, visit art teacher Kelly Martin’s blog. Our school libraries touch every child and are an essential part of the educational experience. LGEF is contributes towards library clerks for all four elementary schools. LGEF is contributes towards PE specialists at our elementary schools. Your donation to LGEF helps fund the RJ Fisher Middle School Music Elective. At Fisher Middle School, one-third of all students opt to take music as an elective each year. Students can choose band, string, orchestra, or choir. There are at least five performances by the Fisher Middle School music students a year, including local events such as the Los Gatos Holiday Parade, and festivals hosted by the California Music Educators Association (CMEA). With future donations to LGEF the music program will continue to grow, benefiting our community through student performances. 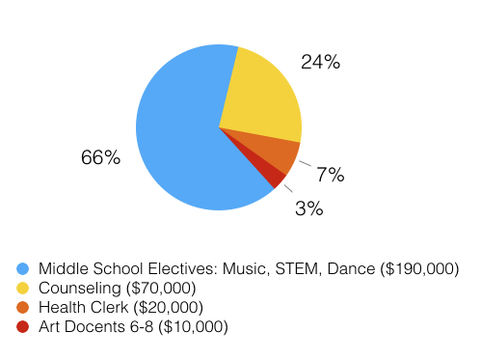 Your donation to LGEF is contributes towards the sixth grade middle school "wheel" at RJ Fisher including classes in STEM (coding), Dance, Art, and Skills for Adolescence. Your donation to LGEF supports the Fisher Social & Emotional Literacy (SEL) curriculum by funding CASSY counseling services. The Los Gatos community recognizes the importance of educating the whole child, and the value of building character and interpersonal skills as a part of every child’s education. Counseling services help students with critical asset development, cultivating an academic and social environment that benefits all students. Read more about what our Middle School Counselors do including photos and quotes. Working under the direction of the district nurse, these dedicated individuals ensure our children feel safe and cared for at school, just like they do at home. LGEF contributes towards health clerks at our schools. Read more about what our health clerks do including photos and quotes. Art Docents of Los Gatos is an all-volunteer community organization provides our schools with a visual arts education for elementary and middle schoolers. Annually, 40 volunteer Art Docents spend more than 2,145 hours in the classroom teaching kids hands-on workshops, art appreciation and art theory implementing a well-established curriculum. Art Docents of Los Gatos also offers multiple programs at Fisher middle school including: Art history in the French and Spanish classes, a two-part class on Scientific Illustrations as part of the science curriculum, and a Guest Artist program, where a professional artist comes to art classes to give an informative and inspiring talks. For the 2018-19 year Art Docents is adding an new Middle School program that blends science and art: "the art of big data". This exciting program introduces students to the many ways to visualize large data sets. Each May Art Docents organize the LGUSD Annual Art Show (held at Fisher Middle School), a community event which displays more than 3,000 pieces of elementary and Middle school student artwork. 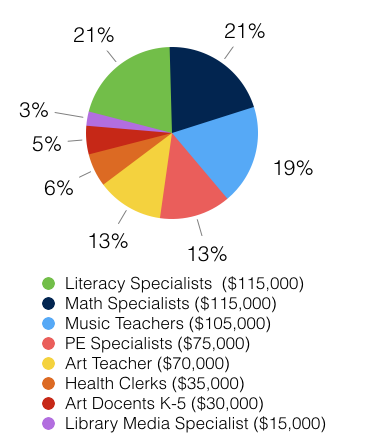 In 2018-2019 LGEF granted a total of $40,000 to Art Docents of Los Gatos to provide Art instruction at all five schools (the Art Docents funding split between elementary and middle schools in the charts above is an estimate).